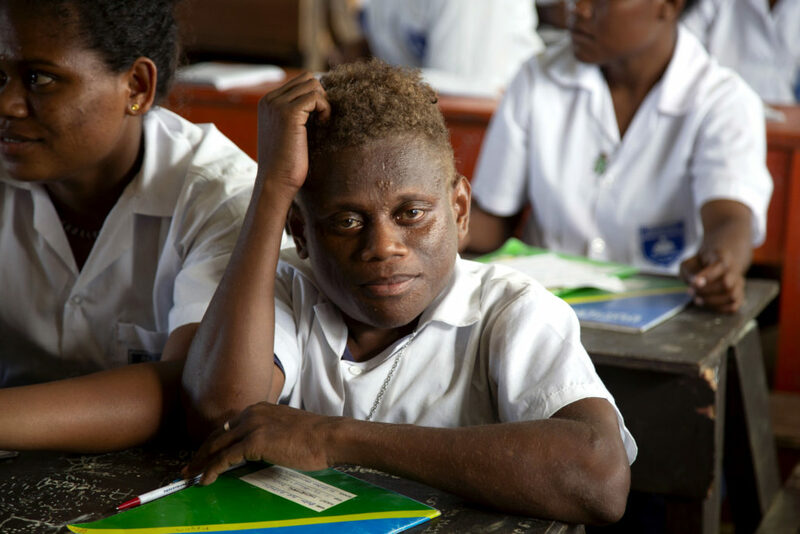 Peter in class at Aligegeo Secondary School on Malaita Island, in the Solomon Islands. Photo: Cassandra Hill/Caritas Australia. Sixteen-year-old Peter goes to a boarding school in the Solomon Islands which has experienced water shortages for 60 years. 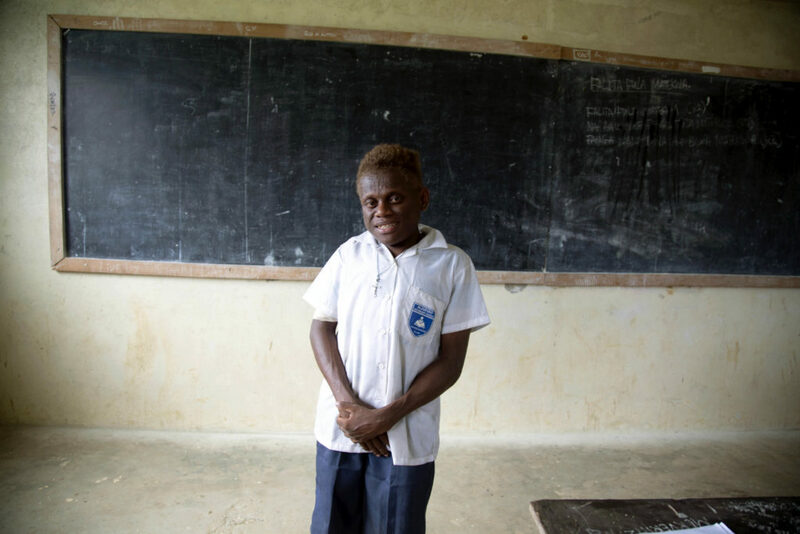 Previously, students would have to walk kilometres each day in search of clean water, which wasrticularly challenging for Peter who is living with a disability. With Caritas Australia’s support, the school has created a new reliable water system. Students like Peter are now in better health and can fully commit to their studies – and work towards a hopeful future. 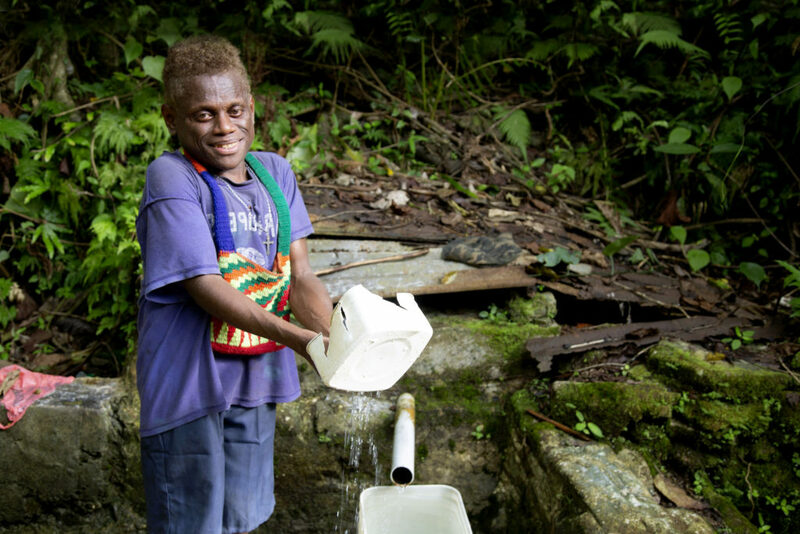 While most Australians access clean water by simply turning on a tap, for Peter who was born in the Lau region of Malaita Island, in the Solomon Islands, water is something he never takes for granted. “’Water is part of our culture, a symbol in our dancing and our drumming. Lau means people who live in the islands,” says Peter. 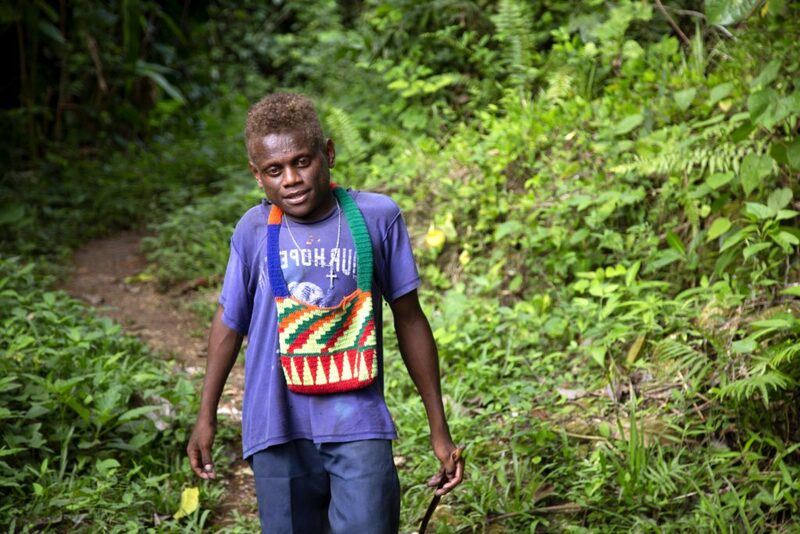 Peter on his long daily walk to find water to drink and bathe in Malaita, Solomon Islands. Photo Cassandra Hill/Caritas Australia. Peter’s childhood has been challenging. His mother left the family when he was little and has since passed away. As he grew older, Peter developed a musculoskeletal disorder, and now walks with the aid of a stick. 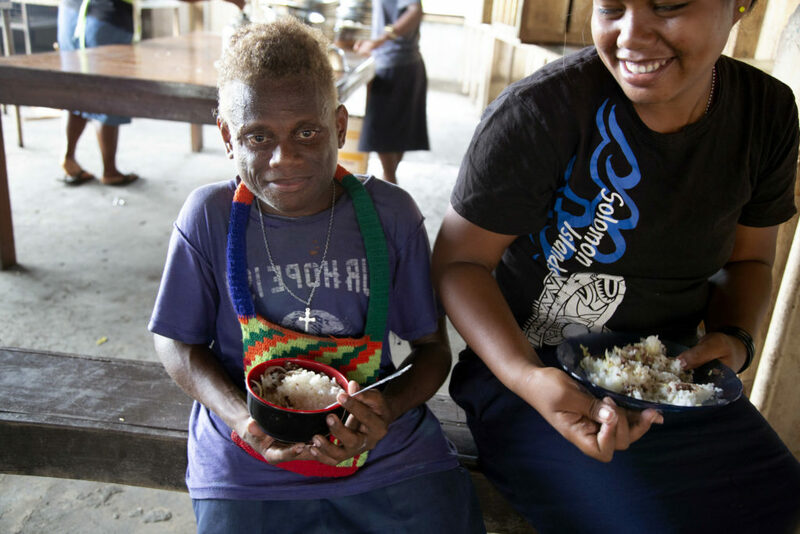 Faced with limited employment prospects and violence in the community, Peter’s father decided to move to Honiara, in order to better provide for his family. He arranged for Peter to stay with his aunt, then attend Aligegeo Secondary School where water was in short supply. “If you wanted to bathe in our community in Lau, you could do it whenever you wanted but at the school, you can only do it in the afternoon for one hour,” says Peter. Water is scarce, as groundwater sources at the school have dried up and rainfall is too unpredictable to rely on. Water in surrounding wells and boreholes often made students sick or gave them rashes. Peter in class at Aligegeo Secondary School. Photo: Caritas Australia/ Cassandra Hill. The Solomon Islands may be a nation surrounded by water, however, it still experiences drought and water shortages – similar to land-locked Zimbabwe (Project Compassion story, Week 1). Around 70 per cent of people in rural areas in the Solomon Islands don’t have access to piped water, while about 85 per cent don’t have access to flushing toilets (World Bank, 2015). Caritas Australia, and partners Caritas Solomon Islands (CASI) and the Solomon Islands Government Rural Water Sanitation and Hygiene division (RWASH), teamed up with the school community to tackle the problem. CASI provided a 90 kilo-litre water tank, electric pump and technical advice, while the Malaita Provincial Government contributed labour and staff. Peter and his friend eat lunch at the Aligegeo Secondary School. Photo: Cassandra Hill/ Caritas Australia. Staff and students took part in training opportunities, dug trenches, carried equipment and are helping to develop a water management plan, which teachers have linked to the school curriculum. Thanks to this hard work and commitment, the school campus has unrestricted access to a safe, water system that has the capacity to service around 1,000 people. “Now they no longer waste time searching for water which disturbed their learning and made them late to class. There is now a conducive environment for learning,” says the school’s principal, Maena Tuita. 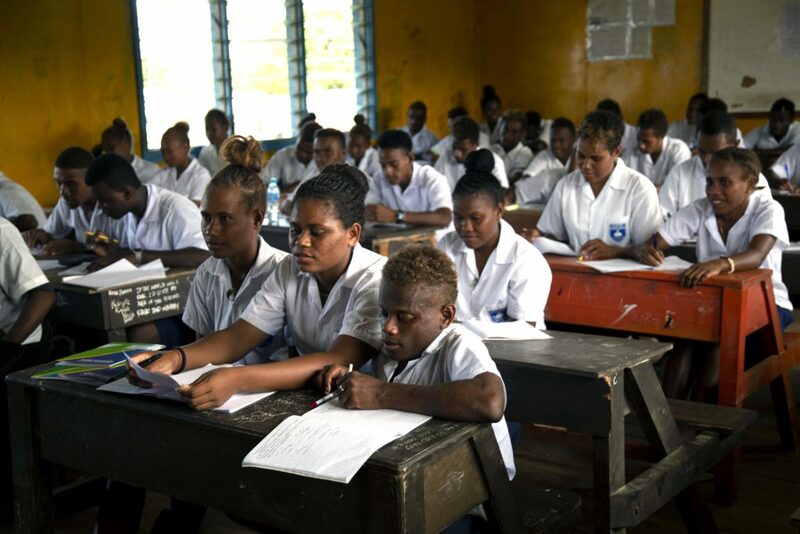 Caritas Australia Program Manager, Ben Breen, who is based in the Solomon Islands, has seen the transformation in students’ lives. After school, Peter likes to hang out with his friends. They joke and entertain each other by dancing. Peter bathes with water from a well about a kilometre away from his boarding school on Malaita Island, in the Solomon Islands. Photo: Cassandra Hill/Caritas Australia. Peter hopes to help others in the future by working for an aid and development agency like Caritas himself. “I would like to thank the people of Australia and hope for Caritas to do more things for us, for our school,” says Peter. However, there is still much to be done at Aligegeo School, with taps, toilets, water and sanitation hardware still in great need at the school.